For the 2010 edition of their UNO Attack! 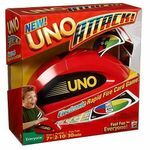 game which Mattel has called "UNO Attack! Relaunch," the company yet again redesigned the electronic card shooter. With this edition, they also added an exclusive Wild Attack-Attack command card to the deck. When this card is played, the player announces a color and then chooses any opponent, points the launcher at them, and presses the launcher button twice. That opponent must take any cards that are expelled. Other than the addition of this card and the changes to the card launcher, game play remains unchanged from previous editions of UNO Attack!